CD Projekt co-founder and CEO Marcin Iwinski says the PC version of The Witcher 3: Wild Hunt will launch with absolutely zero DRM. 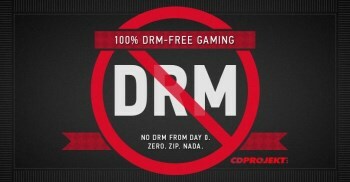 CD Projekt has never made any secret of the fact that it doesn't care for DRM - that's digital rights management, which is a swanky way of saying "copy protection," for those of you just joining us - and that it doesn't believe it actually does any good as far as preventing piracy or improving sales. But today, Iwinski put his money where his mouth is with "an open letter to the community" in which he addressed concerns about the upcoming Witcher 3. "I'd like to say it loud and clear: The PC version of The Witcher 3 will have absolutely no DRM from day 0. Zero. Zip. Nada. It doesn't matter if you choose to buy it on GOG.com and support us directly or buy the game in box format, you'll still get the 100% DRM-free experience. And this goes for the whole world," he wrote. "We've fiddled with DRM in the past (Oh boy! How young and naive we were;)) and that's enough. Lesson learned." The definition of DRM can get a little hazy at times, thanks in large part to the advent of Steam, a point that Iwinski addressed in an update to his message. "It'll be on Steam; the team isn't going to exclude that community by any means," he wrote. "Gamers have a choice in where they buy their games, but where CDPR does have control - like GOG.com - there will be absolutely no DRM." So there you have it. The Witcher 3: Wild Hunt is expected to launch sometime in 2014 for the PC, Xbox One and PlayStation 4.